The U.S. 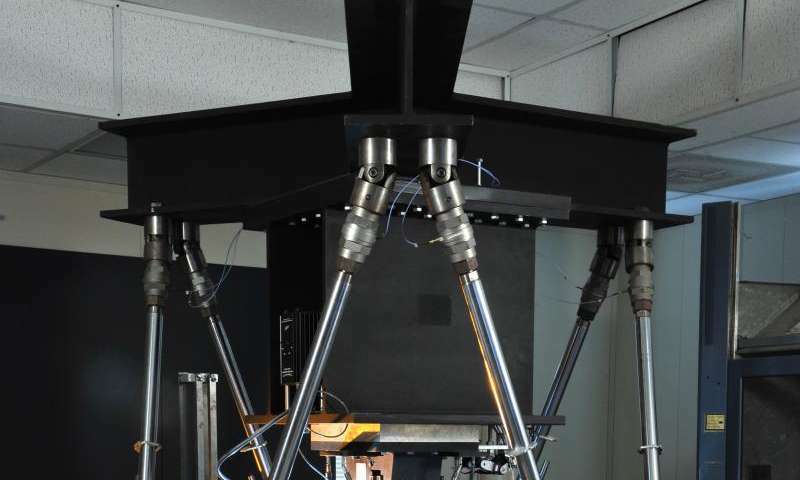 Naval Research Laboratory (NRL) has built a robot to pull, bend, and twist samples of the composite materials used to build F/A-18s and other aircraft. Dr. John Michopoulos leads the project. With a machine that can, as he says, "Measure so much more than anybody else," and some very advanced math, he can "create a theory that is consistent with all these experiments that we made, and works for all scales." He predicts how the materials will perform when made into large structures and used over many years. Sitting in his lab, Michopoulos picks something the size of a luggage tag off his desk. "This is the material that was actually used for the original versions of the F/A-18," he says, "for the skin of the plane." It's a sample of advanced composite, made of resin reinforced by carbon epoxy fiber. "So that little thing that's so light," he says, "is actually stronger than steel." 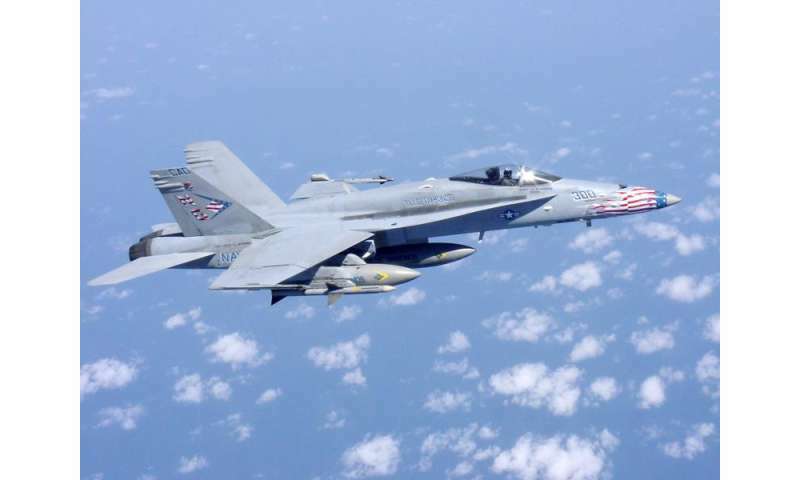 The F/A-18 Hornet became the U.S. Navy and Marine Corps' first strike fighter in 1978; the median age of today's active aircraft is 22-23 years old. As F/A-18s continue to age beyond their design life cycle, showing structural stress corrosion cracking and wing panel composite skin abnormalities, engineers have had to do extensive analysis to develop repairs. "So the need for certifying a new material comes in," says Michopoulos, "and says, 'How are we going to compare a new material and, if we start using it, have confidence it's going to behave the same or better than the old material?'" With the lab's multiaxial robot, his lab's tested thousands of samples like this one to ask, "How are you behaving, when you see all possible loads that you may see when you are part of a structure?" Today, the Department of Defense (DoD) uses a "building-block approach" from 1999, as set out in the Composite Materials Handbook-MIL 17. The approach starts with testing fibers and matrix materials; then the tests get, as the handbook states, "increasingly more complicated," until reaching the level of structural subcomponent (or higher). It's easy to see this is time-consuming and expensive. "I can tell you that qualifying the system for the F/A-18," says Michopoulos, "took about 13,000 specimens and about 18 years." What this means, he says, is, "Engineers are forced to conduct tests at multiple scales because they do not really have a theory to connect the behavior across multiple scales." As private companies and the military continue to look to advanced composites for new aerospace and other applications, NRL's robot could help get aircraft from factory to fleet faster. NRL66.3 robot applies, combines deformations in 72 loading paths Michopoulos realized that, to accurately characterize the behavior of a material, he would have to "capture the behavior of the composites in any possible combination of loading;" as opposed to traditional approaches, where scientists take only "simple loading cases, such as tension or compression." No technology existed to do that. "So we said, heck with it, let's invent it." Named NRL66.3, the robot is a "multiaxial loading machine." It has six devices that apply linear movement, termed actuators, in a hexapod configuration. While a material sample is held by a fixed grip from one end, the actuators move a grip that holds the other end of a material sample, moving it in any combination of up to three translations and three rotations. So the robot can "apply combinations of tension or compression, bending, and torque simultaneously," says Michopoulos. Like the old jukeboxes with an arm to load the next record, NRL66.3 is fully automated. Assisted by two other robots, it will take 72 specimens of, for example the material used in part of an F/A-18, and "apply 72 loading paths in that six-dimensional space." The robot loads each specimen until it snaps, then quickly moves onto the next. A custom-developed machine vision system, with four cameras, captures digital images of what's happening in real-time. While the experiment is going on, the scientists use custom-developed full field measurement algorithms Michopoulos' group has now patented to "take those digital images and analyze them, and convert them to displacement and strain fields." What the experiments do is to, very quickly, capture what might happen to an advanced composite in the real world. Advanced composites age in a very particular way. "The resin that's between the fibers starts developing little micro-cracks," says Michopoulos, which can cause the resin to separate from the fibers or the fibers to break. "A continuous accumulation of micro-cracking (that leads to a softening of the material) can be used as a metric for material degradation assessment." The group has, over the past 20 years, used various robots to test over 150 different material systems, with potential applications for ballistic missiles to rocketry to automobile manufacturing. "So we do have a very rich database," says Michopoulos. A snapped composite specimen is one thing; a theory of how that material will behave when formed into a jet wing is another. But that's what Michopoulos' group has done. "It's highly computationally driven," says Michopoulos. "You cannot write on a small piece of paper a single equation that encapsulates how composites behave." From 2008-2012, the Co-operative Research Centre Advanced Composite Structures (CRC-ACS) of Australia provided specimens to NRL to test and characterize, while they did their own tests using more traditional methods. (Universities in Australia and the Massachusetts Institute of Technology [MIT] also participated in the project, with support from the Office of Naval Research [ONR].) Says Michopoulos, "We tested 1,152 specimens in 12 days; that has never really happened anywhere anytime before." Additionally, as Michopoulos explains, ONR said, "CRC-ACS also is going to create specimens that you're not going to test, but instead they are going to test. But you will tell us ahead of time, in a blind prediction, how they're going to behave." Michopoulos' group "ran predictions on the tests that they would make, which were really bigger specimens with holes or with stiffeners and so forth." And, he says, "We came within a maximum error of three percent on anything that they asked us to predict." Without having tested these specimens experimentally at NRL, they were still getting the same results as CRC-ACS because of all the data they'd captured with NRL66.3. "For me," he says, "it really was kind of fun to see this going before my eyes, and having all the collaborators experience it." NRL collected 12 terabytes of data during the testing period. "Just to tell you how much richness there is in these data," he says, out of the 72 loading paths we applied, an MIT student "based one dissertation out of one of these paths." Michopoulos wants to offer design engineers a simulation environment based on actual data. "Instead of asking the question, 'Is this good or bad in a general sense? '—which again, is never really what they mean—asking, rather, 'Is it good for a particular use for me at this moment for my current needs?'" While Michopoulos is interested in continuing to run experiments on composites, he refers to it as a third-best time activity. 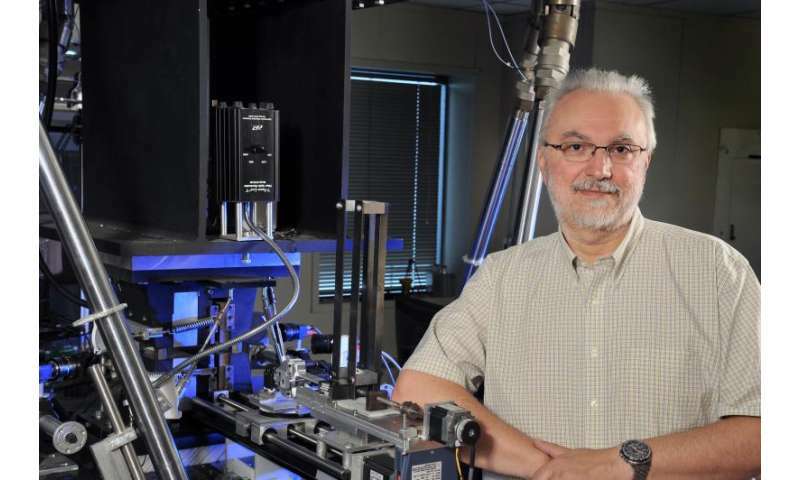 "Characterization of composite materials," he says, "is a domain that I'm fortunate to be able to express—as an industrialization process, an application." But, he says, if done "correctly and efficiently enough, we have some leftover time to reinvest in developing the tools we want in the future." That time he calls second-best time. "If you look at the roots of development of technology, you see that the real revolution and progress has come from the time people spend to develop their tools." What Michopoulos wants to build in the future is "a self-configuring, self-organizing machine—that's the area I want to go. A robot that has a process to optimize its own performance based on how well it collects data for material characterization." Such a robot could give more information, and do it more quickly and with fewer specimens. The robot he has today can apply one loading path per specimen. Instead, he envisions a robot that could "follow a different path, a zig-zag, or a curvy path"—maybe even have actuators that move around to change the machine's shape. "We have initial analysis," says Michopoulos, "that shows that, indeed, we can have the machine decide where it wants to go to get the best possible data for characterizing the material in real time." But then, he says, there's first-best time, "Which is really developing your mind." It's that time that's "the most inefficient and the most painful—but also the biggest fun, and therefore the most exciting." Of NRL, he says, "I could not imagine really thriving anywhere else." One of the reasons he continues to pursue patents and publications is, "I do have a genuine desire to see my group grow in a way that creates value for the military and society in general, and so that my group has an opportunity to use more of their second- and first-best time." Michopoulos has a PhD in Theoretical and Applied Mechanics and Applied Mathematics from the National Technical University of Athens, and pursued postdoctoral research in multiphysics, fracture mechanics, and applied mathematics at Lehigh University. When he tells how he came to be at NRL in 1986, he describes what his future mentor, Dr. Phillip Mast, asked in the interview: "'If you imagine there is a line connecting Socrates with Bertrand Russell, where are you in this line?' Instead of asking me an engineering and mathematics question, he is asking me this question. So then I knew I had to stay."